In 1994 it was host to the Winter Olympics. It was a pretty big deal for anyone that lives around the area. Lillehammer is a small town but has good access to Oslo Centre and Gardermoen airport with a frequent, direct train. The easy access along with relatively cheap flights and plenty of cabins available for rent makes it perfect for any Brits wanting to get away for a long weekend XC skiing – or even downhill at that matter! So, why am I going to Lillehammer? It was my birthday and what better than to spend a weekend away enjoying the snow. 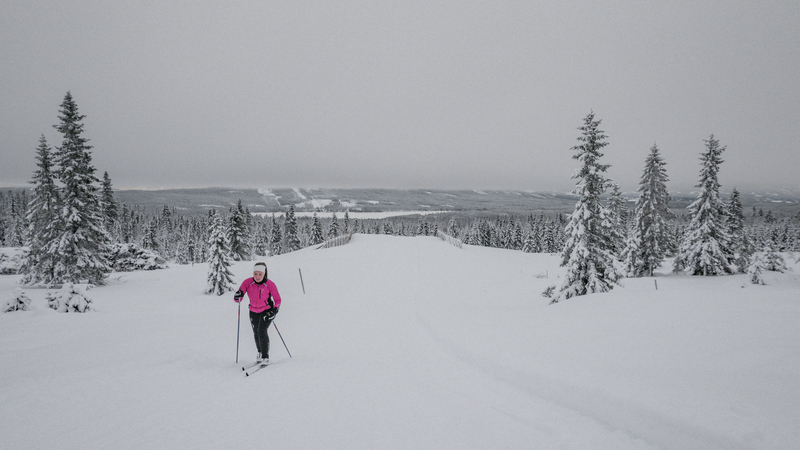 We stayed just outside of Lillehammer not too far from Sjusjøen – THE area to go XC skiing. Arriving Friday night, we dug our way into the cabin and started the fire. The next morning we woke to 10-15cm of fresh powder. It’s not too cold in November, around -1 to -5 during the day, so the conditions are perfect for skiing. After a typical Norwegian breakfast, bread, we headed out into the snow. It felt good to get the XC skis back on the feet. The weather was misty with a little snowfall. Everything was covered in snow. There are so many tracks around Sjusjøen and the maps are easy to read at every junction – all of them showing directions to places with KM written to make sure you don’t go too far. The mist gave it an eery feel to the day. It was still beautiful even if we couldn’t see too much past the few hundred metres in front. Even though it was a weekend, once away from the main arena it was nice and quiet. With the cabin close by, it was nice to get back to the fire and warm the kit ready for the next day. What better way to relax after a day of skiing other than sitting in front of the fire with a cold beer? Overnight we had around 10 to 20cm of fresh snow – powder! The cabin where we were staying overlooks a lake. It’s mainly used for summer, but also looks beautiful in winter time. So, after breakfast, it was back onto the skis. Starting in the same place, we headed in the other direction. It’s pretty early in the season so there was still lots of water flowing just beneath the snow. Conditions were much the same on both days. Misty with light snowfall. Both Marin and I had a wake-up call to the level of fitness needed to push yourself hard on XC skis. So much fun but hard work at the same time. It’s a good feeling but rests were welcomed at the junctions to catch your breath and loook at the map. After skiing it was nice to have a look around Lillehammer the town. Lillehammer is a really nice place. It’s quiet and has a nice feel about it. You can really see why so many XC skiers and athletes base themselves in Lillehammer. The town has so many facilities. There is XC skiing on the doorstep, the ski jump towering over the town, and along with Hafjell only a short trip away you have the perfect downhill ski slope. The long weekend could easily turn into a week, or even longer! Like mentioned at the start, access to the town is easy with regular trains. There’s also frequent buses to get you around if you don’t hire a car. We did have a car which of course makes it much easier to get around – although some of the roads here don’t get salted like they do in many towns so beware! You’ll see almost all of the locals using spike tyres.